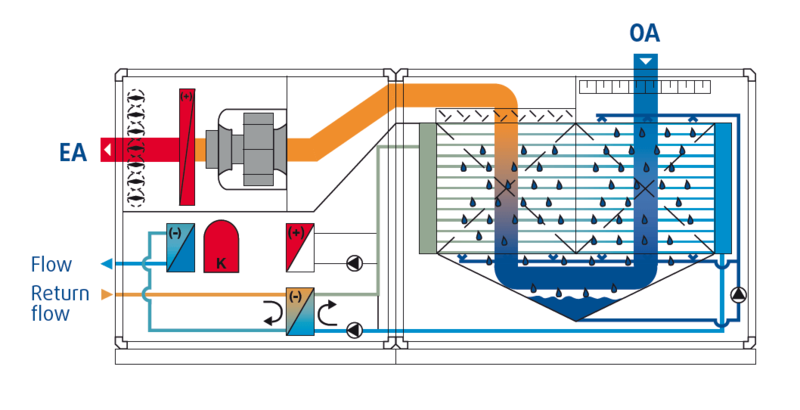 Cooling systems using chilled water can be found in a wide range of areas: For discharging excess heat from rooms with high thermal loads, for cooling industrial manufacturing processes or for comfort air conditioning of buildings. The units of the Hybritemp 97 and 98 series are optimally adapted to these requirements. 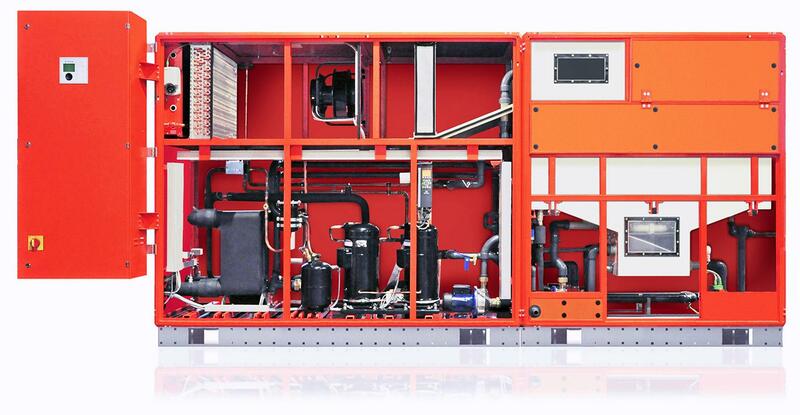 The “all-in-one” unit offers efficient cooling in a very compact way. It is generally not necessary for cooling system components to be installed at or on the exterior of the building – and this drastically reduces the overall investment costs. Hybritemp has been developed in two design variants: The COP-optimised 97 series is characterised by its very high efficiency, while the development of the 98 series focussed on achieving maximum performance with minimum space requirements. The combination of first-class components with precise control and regulation systems guarantees economical operation at all times. At respective low outside air temperatures and humidity, the heat in the process water is dissipated to the outside air. In order to reduce the outside air temperature further and to increase the cooling capacity, evaporative cooling is activated. 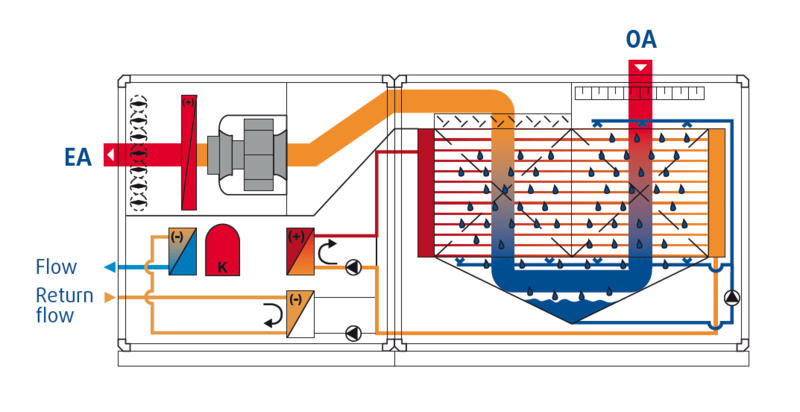 In an intermediate heat exchanger, the process water is cooled down to the required flow temperature. The cooling capacity is controlled continuously by varying the air volume flow rate. When outside air temperature and humidity are rising, the amount of heat that can be dissipated by evaporative cooling will reduce. If the process water in the intermediate heat exchanger can no longer be cooled down to the required flow temperature, after-cooling takes place in the evaporator of the integrated compressor refrigeration system. The heat of condensation from the multistage compressor refrigeration system in part-load operation is passed onto the exhaust air. When an increasing part of the total cooling performance is carried out by the compressor refrigeration system, the condensation heat can no longer be passed solely onto the exhaust air. 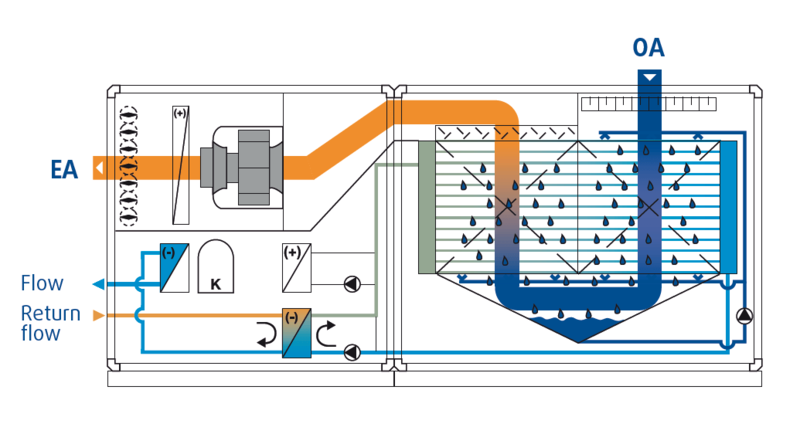 A proportion of the water is directed from the secondary circuit downstream of the intermediate heat exchanger to the water-cooled condenser of the compressor refrigeration system in order to discharge the residual heat of condensation. The controller regulates the condensation pressure in order to operate the chilled water with an optimum EER. If the water temperature in the secondary circuit is higher than the process water temperature, the total cooling capacity required comes from the compressor refrigeration system. 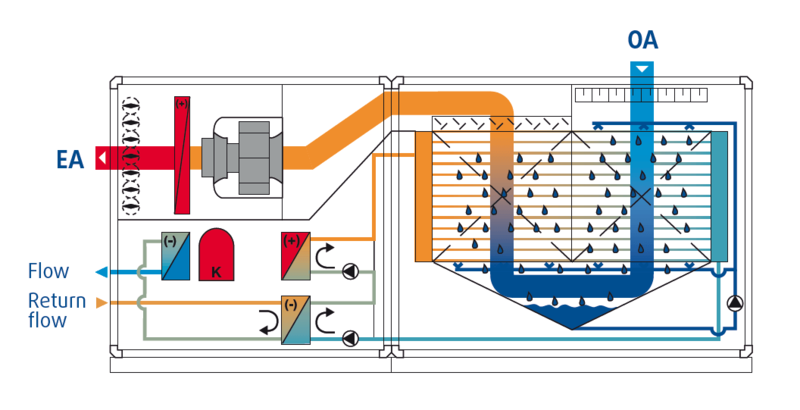 Due to the two-stage condensation heat output in the air condenser (desuperheater) to the exhaust air and in the water condenser to the secondary circuit, only a very low air volume is required. Thanks to the upstream evaporative cooling system, low condensation pressures are achieved, which in return lead to a high EER in the compressor refrigeration system.